Sauder Village, Ohio – Let's Go RVing! Up and out at 6:00 again. Doug, the technician told us that it was a five hour job so we knew we wouldn’t be leaving Nappanee today. We headed over to the lounge along with the other displaced RVer’s, drank our coffee and chatted for a while. Finally about 7:30 it had begun to rain and Jerry suggested we go to a nearby restaurant, the Dutch Restaurant for breakfast. It was very good but I definitely got my week’s worth of salt. I looked up the weather in Archbold, home of Sauder Village (where we were supposed to spend last night) and the weather was good. Since the forecast for Nappanee was all day rain we decided to go to Archbold despite it being 100 miles away. We didn’t have anything else to do or anywhere else to go and we didn’t want to spend the day in the lounge. We started out in moderate rain and it kept up for about an hour but gradually began to clear as we got closer to Ohio. I nearly missed the “Welcome to Ohio” sign but hopefully I can get another tomorrow as we head to Port Clinton. We arrived at Sauder Village a little after 11:00 and went directly to the Welcome Center. We wandered around there for just a bit plus roamed around the gift shop. I saw a magnet I wanted but decided to wait until later to buy it. 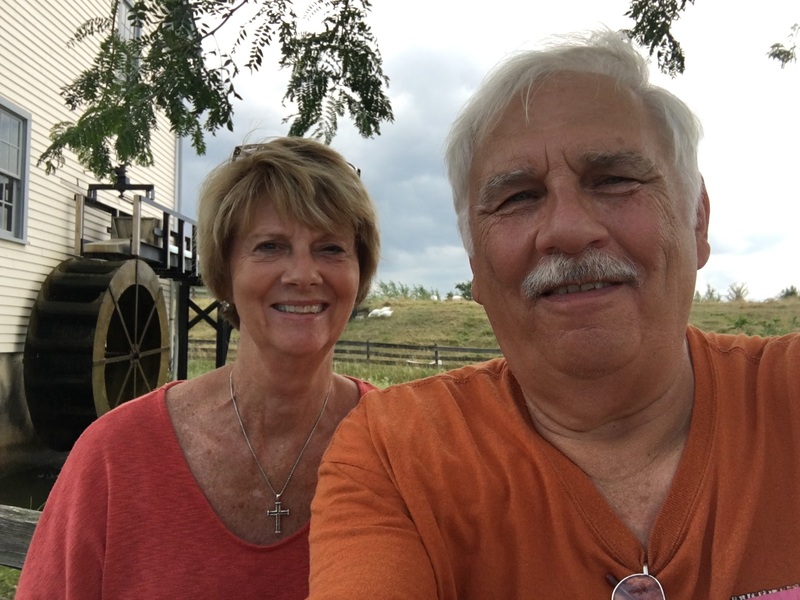 We bought our tickets and headed on out to view “Ohio’s Largest Living History Destination”. The village consists of 40 buildings and they were numbered so we just followed the path. Each shop had a volunteer who could tell us a bit of history about the shop and the surrounding area. Sauder Village is actually located in the Black Swamp. It was the last part of Ohio to be developed and when the people moved to the area they had to dig trenches around their homes so the swamp waters could recede. This was a continuous process until they had enough land to live on and farm. Some of the shops included a tinsmith’s shop, a barber shop, a basket shop, a cabinet shop, a spinning shop and an herb shop. There were also two schools and a couple of churches. After we had visited about half of them we decided it was way past lunch. Jerry wanted to try the Barn where they had a buffet until 2:00. It was 1:50 so we hustled over there. After the disappointing buffet we had on Sunday I was reluctant to try the buffet so I had the salad bar which was very good. Again we were served rolls with apple butter. They were really good. Jerry said his meal was the best meal he’d gotten in a restaurant on the entire trip. I sampled some of his and it was very good. He even asked the very nice waitress for the recipe for one of the desserts. She didn’t give it to him but did tell him how he might be able to make a diabetic version of it. We went back to the village and continued to wander around. We ended up at the Grist Mill where we sat on a bench and enjoyed the cool breeze and shade. Since we had just finished lunch we passed by the ice cream shop even though they had some sugar free ice cream. After visiting the toy shop we decided that it was about time to head back to Newmar. During the afternoon we got a call from the service technician saying our RV was ready. Since we were over two hours away we couldn’t get back today but told him we’d be ready to check out at 8:00 tomorrow morning. Since we will only have the afternoon in Port Clinton we want to get an early start. Hoping for pretty weather. We got back to the campground a little after 5:00, got everything set up again and then stood outside talking to our neighbor Don who owns a Bay Star. Interestingly enough he is from Concord, North Carolina. It’s amazing how we have parked twice next to neighbors from North Carolina and when we were on the tour at Notre Dame there were people from North Carolina on the tour and to top it off, they were NC State fans! Again, small world. We talked to Don until it just got too hot to stay outside. Since he and his wife had only been RVing since October we offered what little knowledge we had gained in three years. We had decided that since we had such a nice lunch we wouldn’t have a big dinner so when we came in we just got on the sofa and started reading. A knock on the door and it was Don. 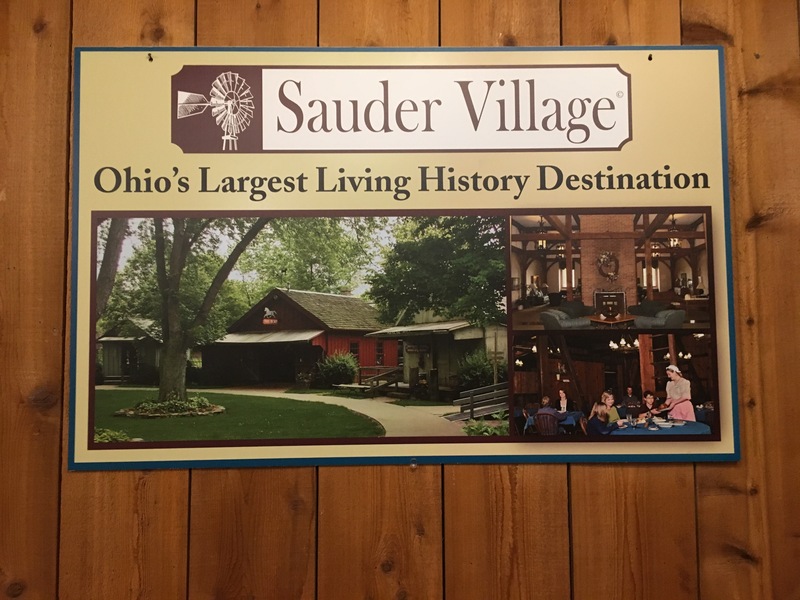 We had suggested that they might like visiting Sauder Village but he had forgotten where it was. This time he was armed with his notepad and wrote down some of our suggestions. Probably our first suggestion to any new RVer is to to join FMCA. The benefits are well worth the minimal cost. We also recommend getting the America the Beautiful pass to the national parks. Right now it is $10 but is going up to $80 August 29, still an amazing deal at that. Oh, you have to be over 62 years of age. With the pass you get access to all of the national parks plus access to all Corps of Engineer parks at half price which is usually about $11 and so far every place we have ever been has been beautiful. Of course by joining Passport you can get half off of your site but you need to do your homework and look at the reviews before you choose one. We have stayed in several and broken even with our $40 yearly fee and only once have we elected not to stay at one because of its appearance. With Good Sam’s you get a 10% discount each night which isn’t much but it adds up so you can quickly get your $25 yearly fee. We forgot to tell Don about KOA but it too offers a discount for each night. KOA generally has a lot that we are not interested in, i.e. playgrounds, etc but you can usually rest assured that you are staying in a nice clean and safe place. It felt good going to bed knowing we didn’t have to be up at 5:00 in the morning although we did plan to leave as early as possible. Doug had called and scheduled check out for 8:00 so we hope to be on the road to Port Clinton, Ohio well before 9:00.